Strategies Unlimited has made its annual market research report, The Worldwide Market for LEDs: Market Review and Forecast 2014. This report foresees revenue growth of 12.9% from 2013 to 2018 for the total market for packaged LEDs, strengthened by 27% CAGR in LEDs in lighting applications. 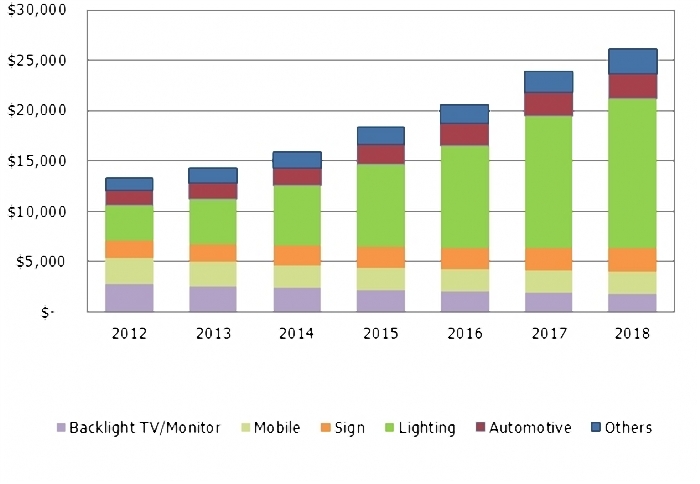 The Worldwide Market for LEDs offers scienfific analysis and a forecast through 2018 for packaged LEDs used in the following applications: display backlighting, mobile devices, automotive applications, signage, and general lighting. The report also provides a comprehensive supplier analysis that evaluates the distribution of revenues for such regions as Japan, South Korea, Taiwan, China, the United States, and Europe. The top 15 companies in the LED industry account for about 81% of global revenues and the top 25 companies take up 93% of revenues. It is clear that quite a few manufacturers continue to struggle to find their status in this fast-changing environment as the packaged LED industry is becoming more and more complex. As a result, we expect consolidation of the market in the coming years.